With the average house in Toronto now priced at roughly $1,320,333 and most jobs now concentrated downtown, it’s impossible for many young adults in the city to buy houses near where they work. If you don’t want to rent, and a condo is too small for whatever you’ve got planned in life, well, there’s always the suburbs (if you’re lucky) and far-flung, smaller cities like Oshawa, Cooksville, Acton or Barrie. You can find a full-on house with its own backyard in some of these cities for less than the cost of a tiny skybox in downtown Toronto, but you’ll pay for it with your time — up to an hour and 45 minutes each way for work in some locations. 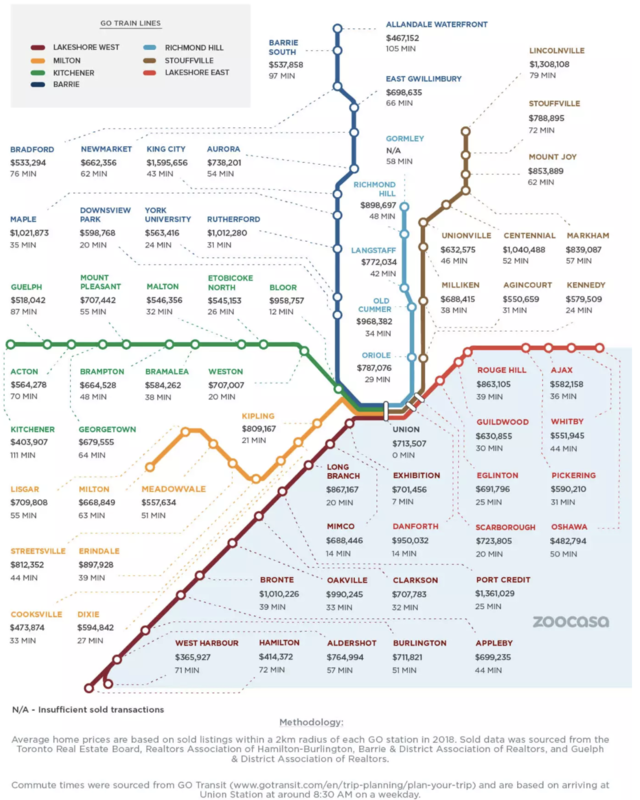 A report released on Tuesday by real estate brokerage Zoocasa shows how much it will cost you, on average, to buy a place within 2 kilometres of all 66 GO Train stations on the Metrolinx network. Based on information from local real estate boards and commute times with a “weekday arrival at Union Station around 8:30 a.m.,” Zoocasa’s map lays out in plain sight your time vs. money prospects. Unsurprisingly, the farther away from downtown Toronto a GO station tends to be, the more bang for your buck you’ll get as a homebuyer. Houses around West Harbour Station near Hamilton were found to be cheapest, at an average price of $365,927 with a transit commute of 71 minutes. Kitchener Station was next with a whopping 111-minute commute and homes priced at $403,907. The least affordable homes near a train station can be found in King City, which is 43 minutes away by GO transit but boasts an average home price of $1,595,656. Port Credit Station takes second place with average home prices around $1,361,029 and a speedy commute time of just 25 minutes. For more information on making your next move, contact us at info@thegrahampartners.com or call/text us at 647-401-4443. Want to search homes or condos for sale in your desired area? Search Here.